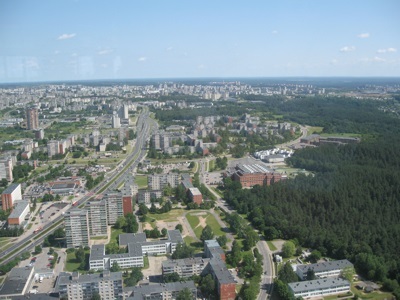 Located in the Southeast of Lithuania at the confluence of the Neris and Vilnia Rivers, Vilnius is the capital of, and largest city in, the country. As of 2005, the city had a population of 553,904. At 1.4 square miles (3.6 km2), Vilnius includes one of the largest old towns in Europe. There are nearly 1,500 buildings in the old town, and although the city is widely regarded as a Baroque city, the architecture encompasses Gothic, Renaissance and other styles as well as Baroque. Gediminas Tower - This is the only remaining part of the Vilnius Castle complex (Lithuanian: Vilniaus piliu kompleksas or Vilniaus pilys), parts of which date back to 1409. Gediminas Tower is a very much a symbol of Vilnius and the Lithuanian nation, being depicted on the national currency, mentioned in numerous patriotic poems, and songs, and having been the site in 1988 where the Lithuanian flag was raised during the early stages of the modern independence movement. Cathedral Square (Lithuanian: Katedros aikšte) - Like Gediminas Tower, Cathedral Square is also very much a symbol of Lithuania. The site is also a popular location for street fairs, parades, concerts, etc. Vilnius TV Tower (Lithuanian: Vilniaus televizijos bokštas) - This distinctive tower, standing 1071 feet (326.5 meters) tall is the tallest building in Lithuania. It was at this site that 14 unarmed civilians lost their lives, and approximately 700 more injured, when they tried to prevent the Soviet military seizing control of the tower (in an attempt to surpress the Lithuanian independence movement) on January 13th 1991. Today there is a museum to these events on the ground floor of the tower, and the "Paukšciu takas" (Lithuanian for "Milky Way") cafe on the rotating observation deck, 520 feet (160 meters) above ground level. Additionally, for braver souls, bungee jumps are available to the public from the roof of the observation deck!